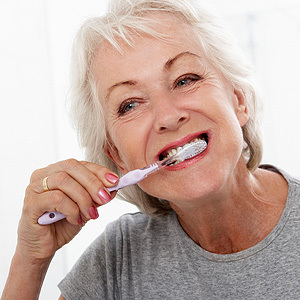 Dental implants are best known as restorations for single missing teeth. 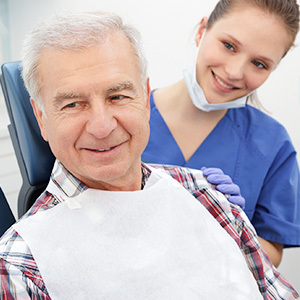 But there’s more to them than that—they can also be used to support and secure removable dentures or fixed bridges. That’s because a dental implant is actually a root replacement. A threaded titanium post is inserted directly into the jawbone where, over time, bone cells grow and adhere to it. This accumulated bone growth gives the implant its signature durability and contributes to its long-term success rate (95%-plus after ten years). It can support a single attached crown, or serve as an attachment point for a dental bridge or a connector for a removable denture. 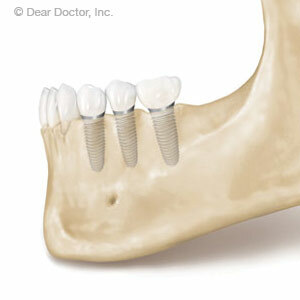 The method and design of implants differentiates it from other restoration options. And there’s one other difference—implants require a minor surgical procedure to insert them into the jawbone. While this might give you pause, implant surgery is no more complicated than a surgical tooth extraction. In most cases we can perform the procedure using local anesthesia (you’ll be awake the entire time) coupled with sedatives (if you have bouts of anxiety) to help you relax. We first access the bone through small incisions in the gums and then create a small channel or hole in it. A surgical guide that fits over the teeth may be used to help pinpoint the exact location for the implant. We then use a drilling sequence to progressively increase the size of the channel until it matches the implant size and shape. We’re then ready to insert the implant, which we remove at this time from its sterile packaging. We may then take a few x-rays to ensure the implant is in the right position, followed by closing the gums with sutures. There may be a little discomfort for that day, but most patients can manage it with over-the-counter pain relievers like aspirin or ibuprofen. 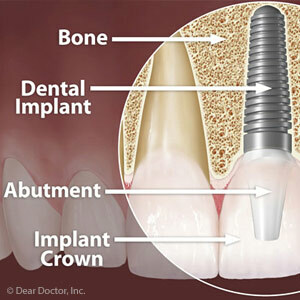 It’s what goes on over the next few weeks that’s of prime importance as the bone grows and adheres to the implant. Once they’re fully integrated, we’re ready to move to the next step of affixing your crown, bridge or denture to gain what you’ve waited so long for—your new implant-supported smile.